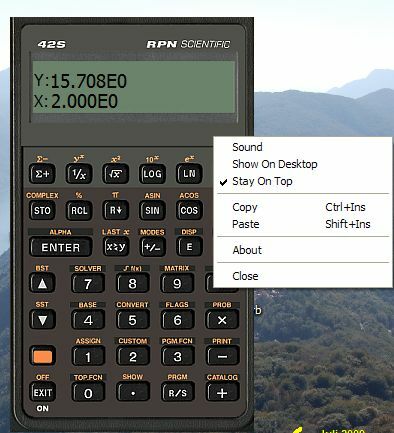 is a simple emulation of the legendary HP 42s Calculator from Hewlett Packard on the Desktop. The input of UPN-Logic calculations are faster than the conventional way with the equals sign ( see Wikipedia). The complex operations and the matrix operations are not yet implemented. Also it is not possible to program the calculator. The free version has no restrictions, so you can test the version before buying. The "About" Message will not been shown anymore with a registrated version. All further updates are free and no more About at startup is shown. If you have any questions, send an E-Mail to ThGSoft Sales.